Thank you all for making this project a reality! 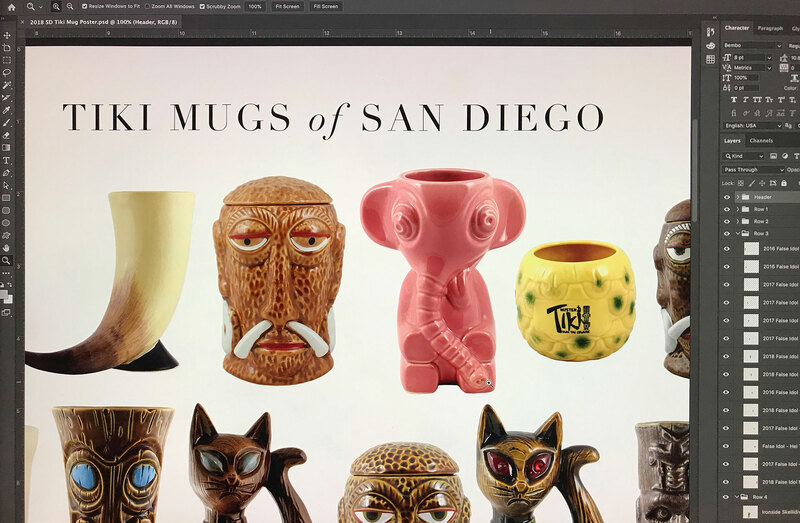 Art for the limited-edition Kickstarter Backer Reward poster, Tiki Mugs of San Diego has been completed and is now in proofing — we are adjusting some of the photography for color, contrast, etcetera, and double-checking all our facts about the mugs. The mugs were shot from four private collections here in San Diego — thank you all — shot digitally on a Canon Rebel EOS T5i. The (literal) mugshots were color-corrected and then painstakingly outlined in Adobe Photoshop CC 2019. The master CMYK Photoshop file contains 59 layers and is a whopping 938.6MB in size! Fonts used are Didot and Bembo, both classical serifs, and the same used in the upcoming book, Ninety Years of Classic San Diego Tiki, 1928-2018. 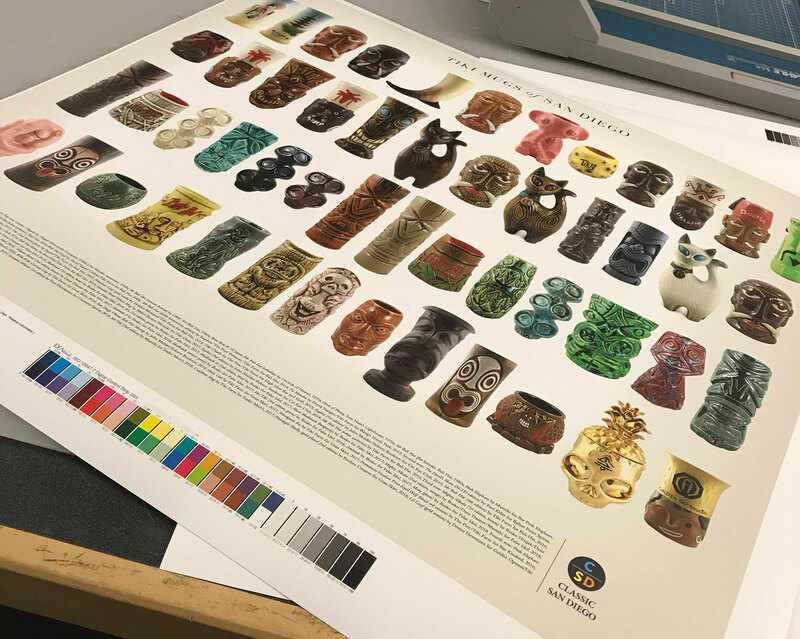 Industry-standard, certified Fiery GRAYcoL2006 proofs are being pulled from an EPSON SC-P90x0 CT printer, with ISO 12647-7 digital control strips. *An old inside-joke from waaay back when we’d call up the color-house asking about our composite printing film and proofs. “Not sure, lemme check…” We’d be put on hold and wait. And wait. And wait some more. This entry was posted in News, Tiki. Bookmark the permalink.